A variety of musical genres developed as if no restrictions. The flow of music that inspires one another to the flow of music. Blend various musical genres can bear the flow of new music a completely different with "broodstock". Everything is free. Without a clear formulation. It then becomes important is how the music can be enjoyed by the public. How the music can also inspire his audience to do something positive. One type of music in question is hip hop. Historically, hip hop is artificial sounds of pounding feet of the soldiers who were wearing shoes greatness. Still according to the story, the idea just showed up. When a sudden burst of hip hop name, they, the originator, was joking with one of their friends who have recently joined the Armed Forces. Until finally emerged, said hip-hop. Hip hop is basically one type of music that was born as a mix of different musical genres other. First appear and reveal the existence of himself around the 1970s. A group of people who first introduced the hip hop music in the wider community is a group of Afro-American and Latin-America. Hip hop music is a "puppy" of rap music mixed with dance break dance, music is usually played the Disk Jockey. Lately hip-hop music also enlivened by the mix of beat boxing. Another element found in hip hop music is not just related to music. Hip hop has now become a way of life for its devotees, like fashion and the use of languages ​​"thugs". Like the man who has a city-born, hip hop too. The flow of this music was born in The Bronx, New York. Afro-American group who first introduced it was Grandmaster Flash and The Furious Five. At first, hip hop is the music of DJ or Disc Jockey who were given the variation in screenings. Variations are then produce unique sounds. To fill the vocals on the DJ music was varied, rapping technique is used. Hip hop is one kind of upbeat music. Beat the faster it finally "forced" the audience to not remain silent while enjoying the music of hip hop. Until finally emerged a new dance movement as the birth of hip hop music. Dance movements are very identical to the movement broken. The movement then that is what we call the break dance. Development ensued. Hip hop emerged as a lifestyle and identity characteristic of a particular social group in society. Hip hop also then accompany the presence of a new form of creativity in society. A creativity that does not actually have anything to do with music. A new art can be inspired as well from this hip hop music. Art and creativity in question is graffiti. 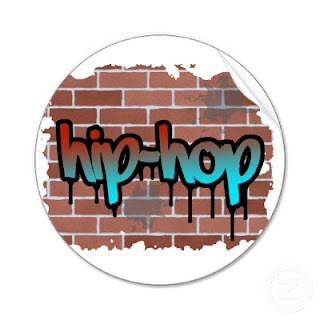 Hip hop was "born" from a variety of musical genres. However, as an individual, hip hop in fact also trained many other arts. Hip hop "birth" a new type of dance and hip hop also "delivered" a completely other creativity has nothing to do with the music world.